NACHC’s training program strives to empower adult learners with strategies and best practices to address challenges facing today’s health centers. Regional training workshops are offered nationally, throughout the year. Online learning events are provided on an ongoing basis. Check our Calendar of Events or sign up for our email listserv to receive updates on new training opportunities. 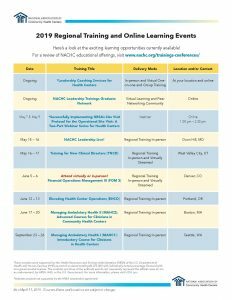 For more information, please contact us at trainings@nachc.org. Questions? Contact Cindy Thomas by email or phone at 301-347-0400. Questions? Contact Gerrard Jolly by email or phone at 301-347-0400. Save now on early registration! Save now on early enrollment! Unless otherwise noted, all projects listed are supported by the Health Resources and Services Administration (HRSA) of the U.S. Department of Health and Human Services (HHS) as part of an award totaling $6,375,000 with individually noted percentage financed with non-governmental sources. The contents are those of the author(s) and do not necessarily represent the official views of, nor an endorsement, by HRSA, HHS, or the U.S. Government. For more information, please visit HRSA.gov. *Indicates projects not supported by the HRSA cooperative agreement.